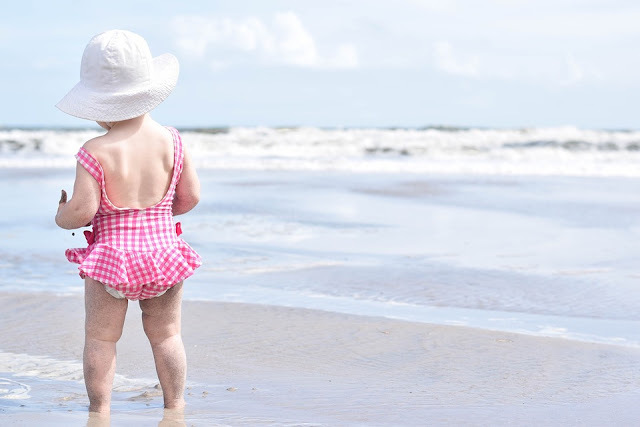 The prime reason why Baby UV Beachwear is able to provide the protection it offers is because of its construction. Being tightly woven, these clothes have minimal space in between the yarns, thus making them effective in stopping the sun rays from passing through. The next factor is the dyes, which can lower the impact of ultra violet rays. Some dyes are known to absorb less, and sometimes no amount of sun rays at all, thus offering maximum protection to the wearer. The type of fibre used in UV protection swimwear can also affect its effectiveness. Polyester is known to be the best when it comes to disrupting the ultraviolet radiations. Other than this, nylon is quite good as well, however, wool, silk, cotton and rayon provide the least amount of protection. Besides these factors, the level of protection offered by UV swimwear can also depend on the style of the garment. To suit the preference and provide comfort to the wearer, these garments come in various styles. You can opt for the ones offering complete or partial coverage and with or without sleeves. Such garments keep the babies better protected from sun, as compared to applying sunscreen lotions and creams. Such creams get washed away easily while in water, requiring you to apply them again and again, on the other hand, the babies can stay completely protected with quality UV swimwear, though I do advise still wearing sun cream. Considering the factors mentioned above, it becomes essential to choose the UV protection swimwear for your baby with great care. First of all, you should rely on reputable brands only, which are famous for providing quality garments. Such companies take their reputation very seriously and make sure to offer the best quality products to their customers. Secondly, read the label of the garment carefully to know about the construction and care of the garment. This will help to ensure that the baby UV beachwear you are buying will be able to provide the best protection to your baby. Lastly, the sun is nice, but to avoid any risk associated with the sunny weather, it's best to avoid the sun during peak times, instead waiting for the cooler evening temperatures to arrive. I only leave my home with Spud if it's essential in summer, and wherever we do go, I make sure he is topped up with fluids and has a sun hat along with other suitable summer clothing and protection.